Welcome to Critic's Notebook, a quick and off-the-cuff car review consisting of impressions, jottings, and marginalia regarding whatever The Drive writers happen to be driving. Today's edition: the 2018 BMW X2 xDrive28i. Quick Take: Based on the same Mini-derived, front-wheel-drive-based platform as the BMW X1, the X2 brings Bimmer's "sports activity coupe" style cues to the subcompact luxury crossover segment. In spite of those front-wheel-drive roots, the X2 drives every bit like you'd expect a BMW to do. While it’s not what you’d consider fast—that’s a word better saved for the new X2 M35i model—it’s peppier than you’d expect in real-world, around-town driving. The throttle response in the default Comfort mode is a little too lethargic to keep up with busy urban traffic; nudging the drive selector tab up to Sport solves that problem by keeping the engine closer to the meaty part of the powerband, but that adds too much artificial weight to the steering. The best compromise is to slide the shift lever leftward from Drive, which puts the transmission into Sport mode without affecting the steering. So set up, the X2 feels peppier than the combo of 228 horsepower and a 3,662-pound curb weight would lead you to assume. The handling, likewise, hits a good balance between sharp reflexes and a smooth ride (though the 19-inch wheels on my test car certainly helped with the former and chipped away at the latter). The steering rack is a little slower than expected at first blush, given the car's compact size—there's no way to make a 90-degree turn without shuffling your hands from 9 and 3, no matter how flexible you are—but once you adjust your reflexes to compensate, it's a willing dance partner, flitting about with lightness and verve. 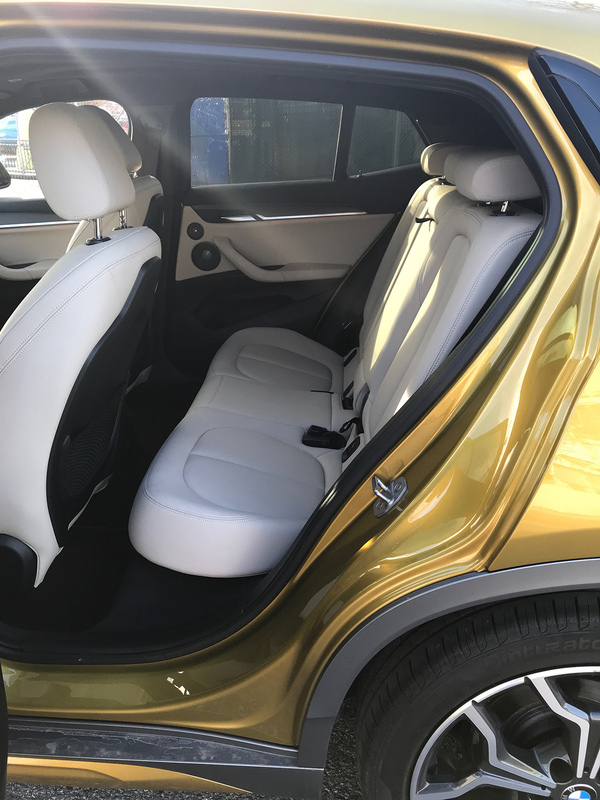 The X2's cabin is airy and comfortable, especially with the light beige seats and trim to brighten things up. 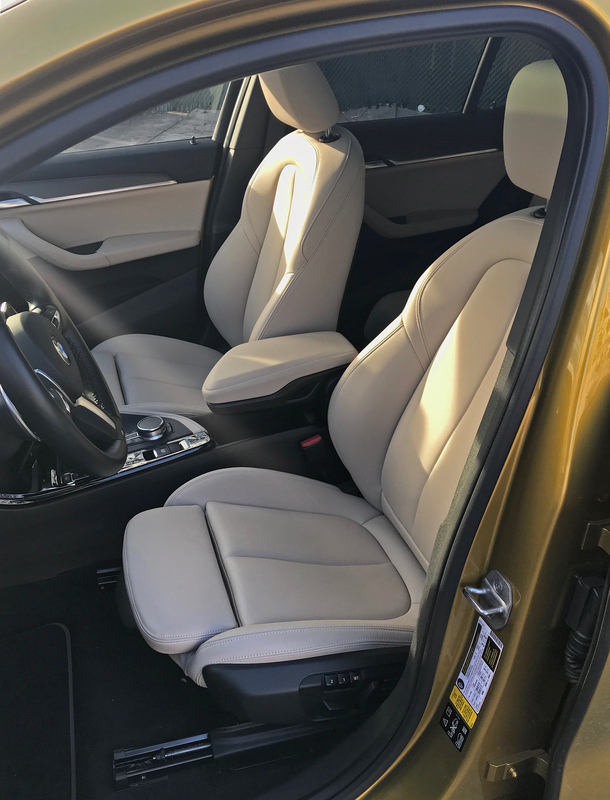 The Sensatec faux leather feels every bit as good as the real thing...at least, as good as the leather you'd find in a subcompact Bimmer. 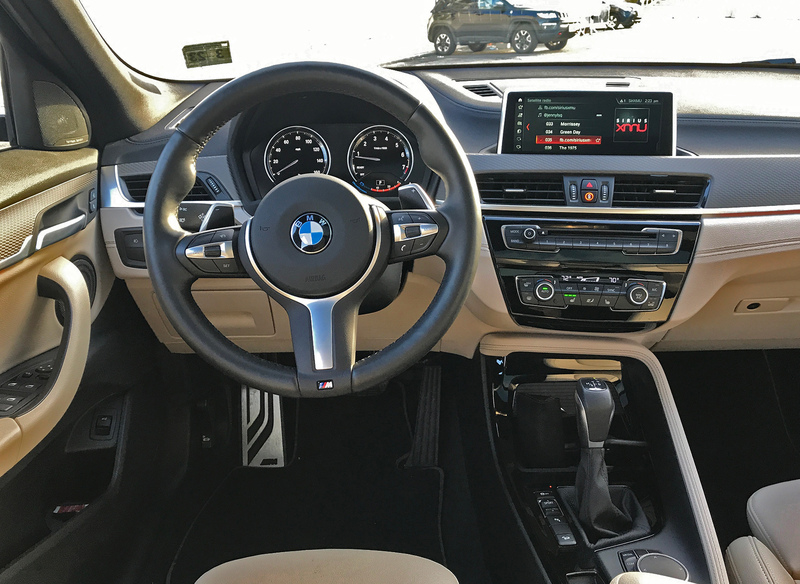 Likewise, the interior design and control layout will be familiar to anyone who's been in a BMW in the last couple decades, though the latest version of the instrument panel looks sharper and cleaner than ever. City drivers, rejoice: The X2 happens to be a very urban-friendly size. At just 172.2 inches long, it can slide into even small parking spaces with ease. And paired with that taut, responsive suspension, it’s easy to slip through holes in traffic that drivers of larger SUVs would think twice about. U! G! L! Y! You ain't got no alibi, you ugly! You ugly! Yo' momma says you ugly! Seriously, the X2 is shockingly ugly. The basic one-and-a-half-box shape isn't bad, but the longer you look at the details, the less appealing it becomes. The chunky 19-inch wheels that come with the M SportX package and the wheel arches that have to accommodate them look disproportionate on the tiny frame, especially up front, where the high-riding arch is smushed against the headlights and hood. The triangular faux air intakes on the face seem yanked off a car penned using an entirely different design language; the sunken round fog lamps look like negative beauty marks in more ways than one; and the dark plastic trim around the lower front air intake brings to mind a missing lower jaw. The golden paint known as Galvanic Gold Metallic—which I can only assume was inspired by baby poop—does it no favors, either. The interior may look inviting, but how comfortable you are inside will depend on how whether your proportions lean Lilliputian or Brobdingnagarian. Tall of frame? Meet Mister B-pillar, who'll be staring you dead in the eye every time you glance at your blind spot. Don't plan on pushing that seat forward to compensate; even with the driver's throne all the way back in its tracks, any lanky left legs will be cramped up against the tall dead pedal. If the front seat is bad, the back is worse. As the video leading off this post makes quite clear, back seat is borderline useless for human occupation. The claimed 36.7 inches of rear legroom vanishes with someone tall sitting up front; neither grown-up legs or little-kid safety seats are likely to squeeze back there. Unless the biggest back-seat passengers you carry belong to the family Canidae, anyone who needs to put living creatures in the second row on a regular basis is better off looking elsewhere. The X2 isn't exactly a steal for what amounts to, in some ways, a gussied-up Mini Countryman—at least, not when you start piling on the options in stereotypical German automaker fashion. While it starts only a couple grand above the average new car transaction price of around $36,000, once you dive into the add-ons to slap on a bit of that luxury car veneer, you can easily wind up gawking at a $50K crossover with vestigial rear seats. 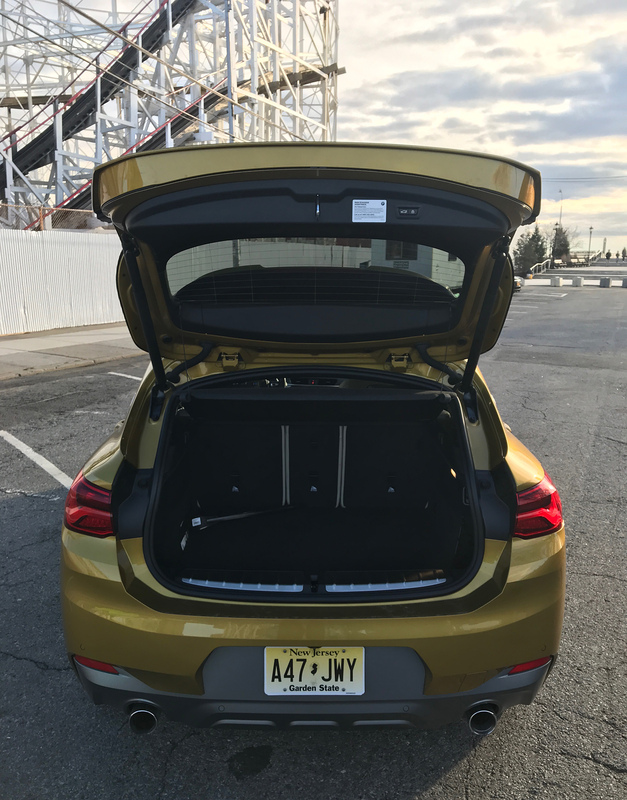 It doesn't help matters that the BMW X1 parked right next to it on the showroom floor is a hair cheaper, drives almost identically, and offers more usability, packing two extra inches of headroom, a skosh more rear-seat legroom, and seven more cubic feet of cargo space. And, in what would seem to be a killing blow to its style-focused SAC sibling...the X1's conventional two-box crossover shape and mini-X5 looks are far more aesthetically appealing than the X2, which looked like it was forced to do its Euro NCAP frontal crash test against the ugly tree. The advantages of sport-utility vehicles are legion for many people, but most of them stem from one intrinsic fact: They ride high. It gives them greater ground clearance, makes it easier to climb in and out and load things inside, and puts the driver's eyes up higher, improving visibility and leading many people to feel safer. But that also gives such vehicles a higher center of gravity, making them feel less engaging than cars. Add in the added weight that comes with scaling up these vehicles to match their height, and you're wind up with, well, the conventional SUV. With its small size, the X2 tries to counter those negative traits while keeping as much of the positive ones as it can. But it arguably goes too far in the wrong direction. The X2 has abandoned many of the features people want out of a crossover—space, height, a semblance of all-terrain capability—without giving enough of the sleek, coupe-like style and performance people who opt for such a vehicle presumably desire. If you're looking for SUV advantages in a reasonably-priced BMW, why not go for the X1? Or, if style or an entertaining drive is your top priority, why wouldn't you buy the spectacular new 3 Series, which you can have well-equipped in M Sport 330i xDrive trim for the same price as this baby crossover? It's fresher, faster, more fuel efficient, and it's not that much lower to the ground. And, for what it's worth...both of those cars are waaaaaay better to look at. What should have been a normal test drive became an unforgettable experience.